The Stella and Charles Guttman Community College, founded in 2011, is committed to implementing innovative practices in community college education to best prepare its students with guided pathways to senior colleges and the world of work. The curriculum is built on a first year experience (FYE), interdisciplinary programs of study, and methods of student engagement designed for student success. Shared governance is a Guttman community commitment that encourages interdisciplinary and interdepartmental collaboration while honoring the strengths, interests, and responsibilities of our faculty, staff, administration, and students. 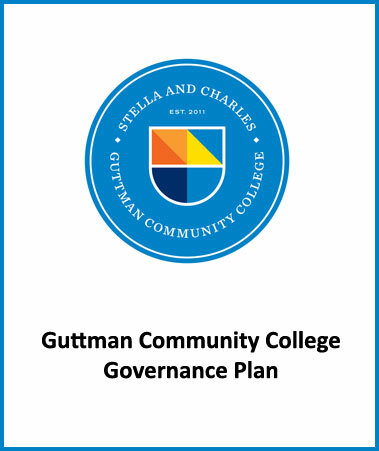 On October 23, 2017, the CUNY Board of Trustees approved Guttman’s new Governance Plan, which was passed at the Guttman Council on May 30th and September 12, 2017.